Batsquatch - Half bat, half Bigfoot. 100% terrifying and people have seen it. Batsquatch is even more elusive than Bigfoot and has only a few scarce reputable sightings. Bigfoot reigns supreme as the cryptid to hunt for in the PNW, but the Batsquatch still has captured many people’s imaginations. 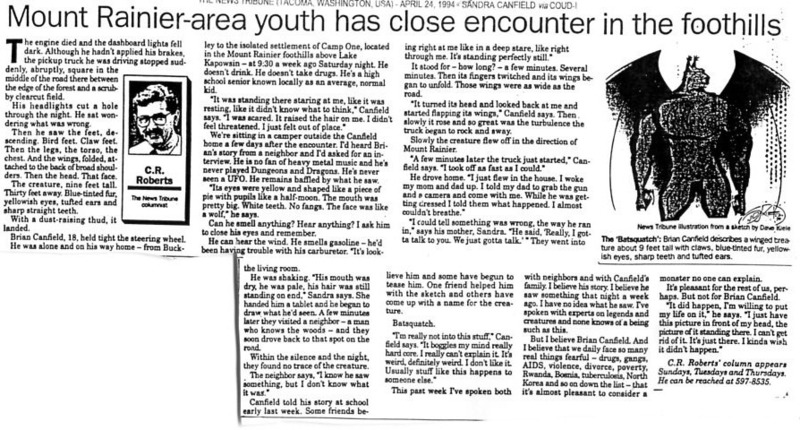 The first report of Batsquatch is from 1980 in the Mt. Saint Helens area. The beast’s general description is of a great winged bat with purple skin, bashing red eyes and a loud deep base yell. Is it real? That remains to be seen, but it is as harder to prove something doesn’t exist than it does. To further complicate things, it appears that false Batsquatch information and patently fictitious accounts have found their way onto the Internet. May 1980 – The first Batsquatch sighting? It is widely reported that on May 1980 was the first time the creature was supposed to have been seen as it showed itself in the shadow of the clouds during the Mount Saint Helens eruption. However I am still searching for any first hand reference to this sighting. If you have a link to an original source for the 1980 Batsquatch sighting, email me or post a link in the comments! Paul Dale Roberts posted on the site Unexplained Mysteries an encounter recounted to him by some hikers on Mt. Shasta that sounds like Batsquatch. I can imagine that if you were face to face with something like that you might be too struck with fear to snap some pics. But with no physical evidence, it makes it hard to prove as a real encounter. A report was posted on Batsquatch.com about an encounter two men had with Batsquatch that was supposed to have been printed in a newspaper. Fear continues to dominate the men, woman, and children of this town as a dark shadow looms overhead. Suspicions persevere and rumors spread as far too many sightings of “a winged bat-like creature” go unexplained. It started as childish rumors after the May 1980 eruption of Mount Saint Helens and has spread to community horror as the truth Batsquatch over Mt Rainier continues to emerge. While preparing for a climb in early 1994, local mountaineer and liquor store owner Butch Whittaker managed to take several pictures of the beast during a rare midday flight (see left). Butch Whittaker, expert in paranormal activity and unexplained phenomena, considers himself lucky to experience this encounter but adds, “I’m not surprised. These things happen to me all the time.” Although government officials deny the existence of any photographic evidence, our staff experts closely scrutinized all photos and found no reason to hold this position. To date four goats, five chickens, two cows, and our prized pig are unaccounted for. No humans are reported missing but this is no measure of the never-ending toll placed on this community’s pride and mental well-being. All Pioneer Day festivities were canceled last week and with the recent loss of Priscilla Pig, scheduled dancing this Saturday presumably will fall prey to this monstrous being as well. Neither Police Chief Durhamm nor our Mayor will estimate potential long term effects of continued attacks but both were obviously saddened by the loss of Priscilla. This account has been denounced as a fake by the people at WhalesInSpace.com. Their arguments seem valid and the story seems suspicious. April 1994 – A solid report of Batsquatch at last? One solid report of Batsquatch comes from an interview posted in the News Tribune out of Tacoma and written by C.R. Roberts. Both the paper and C.R. Roberts are real and that makes this a much more believable account of a Batsquatch encounter. The engine died and the dashboard lights fell dark. Although he hadn’t applied the brakes, the pickup truck he was driving stopped suddenly, abruptly, square in the middle of the road there between the edge of the forest and the scrubby clearcut field. His headlights cut a hole through the night. He sat wondering what was wrong. Then he saw the feet, descending. Bird feet. Claw feet. Then the legs, the torso, the chest. And the wings, folded, attached to the back of the broad shoulders. Then the head. That face. The creature, nine feet tall. Thirty feet away. Blue-tinted fur, yellowish eyes, turfted ears and sharp straight teeth. With a dust-raising thud it landed. Brian Canfield, 18, held tight to the steering wheel. He was alone and on his way home – from Buckley to the isolated settlement of Camp One, located in the Mount Rainier foothills above Lake Kapowsin. He doesn’t take drugs. He’s a high school senior know locally as an average, normal kid. It stood for – how long? – a few minutes. Several minutes. Then its fingers twitched and its wings began to unfold. Those wings were as wide as the road. “It turned its head and looked back at me and started flapping its wings,” Canfield says. Then slowly it rose and so great was the trubulence the truck began to rock and sway. Slowly the creature flew off in the direction of Mount Rainier. Skeptics will play this off as the ramblings of a teenager, but this seems unlikely and Brian Canfield was held up to be a responsible person with nothing to gain by fabricating such a story. 1998 – Another Fictional Batsquatch Sighting? Another Batsquatch sighting story that makes the rounds is that of a hiker that saw a Batsquatch take a hit from a log truck and fall into the canyon below. 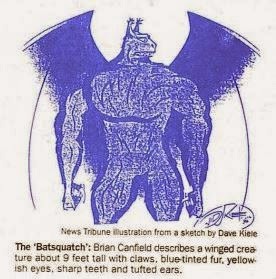 No location is given and the fact that it was posted on Batsquatch.com originally makes it HIGHLY suspect of being real. It was a dark and stormy night. I had taken a fall and landed not too far from the edge of a cliff. Being knocked out, I don’t know how long I had laid there, perhaps three or four hours, my watch had been torn off by the fall along with most of my gear. I was barely conscious when I heard a loud, deep base like yell from the air. The sound was accompanied by a semi truck horn from below the cliff from which I had almost rolled off, hours earlier. I gazed below, trying to focus my eyes, to see clearly. My head pounded from the fall I had taken. It was impossible to realize that the next few moments would change my life forever. What I saw, I kept secret for many years, mainly because I had a good job and I didn’t want to lose it. Perhaps I shouldn’t have kept silent, my silence has caused the death of so many animals and put a town at risk. At risk of what? I will let you be the judge. I will not come out and let my name be known. However, I will tell you what happened that night and the following days. You can be the judge. I was able to witness a logging truck, filled full of Douglas Firs, hit a large object in the middle of the narrow dirt logging road. I thought it was a large stump at first sight, but the object, upon being struck, bounced into the air, almost flying, then fell into the canyon below. It was strange, because I could have sworn the object was purple and had wings, but I attributed the color to my blood stained glasses and the wings to my inability to see very clearly at the moment. What I did see was a cloud of dust from the semi as it’s brakes were applied, the driver attempting desperately to miss the object in the road. At first the truck slid headlong into the object, then as the truck hit the thing, it must have dazed the driver of the truck, because the long semi abruptly swung left hitting the cliff wall, then jack knifing. The rear of the trailer, still sliding, slowing as it swung precariously near the edge of the right side of the road, one hundred feet above the steep, rocky walled valley below. Then as if in slow motion, the dirt road under the rear of the trailer gave way and the rig slowly, started moving, falling, trailer first over the edge of the road. It was as if something had clutched the back of the trailer and pulled it over the side of the logging road. I desperately tried to see through the cracked windshield of the semi before it too followed the rest of it’s trailer over the edge of the road. Always, I will remember the sound of the twisting metal, as the truck slid down the valley cliff and crashed to the bottom. There was no explosion, no fire, just the sound of metal scraping against rock and echoing off the canyon walls. A few moments later, only silence and a small cloud of dust rose from the valley below me. I couldn’t see the where the truck ended it’s slide down the rocks, it had disappeared below the steep sides of the canyon. The forest was eerie, of all the things a person could think of after such a terrible accident, what I remember the most is the silence of the forest. There was no wind, no sound of birds, nothing. It was as if the time had stopped. The forest had ceased to be alive. Reality finally set in. I thought of how I’m going to go down to see if the driver was still alive. No, that had to be crazy, no one could have survived such an event. I suddenly realized that I was sore and bruised everywhere. Now, my reality was coming back to me as I felt the wet blood on my forehead. I slowly moved my legs, thank goodness I could still move them. I slowly tried each of my other appendages, hoping I was still in one piece from my fall, how many hours before? Judging by the sun it appeared to be mid afternoon, the last I could recall it was ten thirty in the morning. After assessing I was still in one piece, I cleaned my glasses and began looking for a way to the floor of the valley. It wouldn’t have been easy without a very long rope and some experience in repelling. I had neither. I decided the best course of action would be to hike back out and get help. I had gone only about ten feet into the dense underbrush, when I heard and felt an unusually strong gust of wind. The forest was still unusually quite. I decided to sit down and enjoy the breeze, hoping it would give me a brief moment of refreshing before I began my hurried march to get help. As I sat in the dense brush, a large shadow came over my part of the forest. I gazed out and as incredible as it may seem, I witnessed a large purplish beast descend onto the very spot where I, only moments earlier, had laid. It had with it another beast, that was battered and not moving. To my horror, I realized that this second beast was the object the truck driver had hit on the road. My first thought was to rush up to the beast and ask if it would help me discover if the truck driver was still alive (Obviously, I had not recovered from my head wound, at that time). Fortunately, I regained my senses and decided not to go rushing up to this creature with my arms waving about. Enough about me, I’m sure the reader would like to know what this creature looked like. It was purple. Yes, I know you already have guessed that from my earlier description, but when I say (or write) that it was purple. I mean it was really purple. It’s skin, claws, hair, nostrils, everything about this creature was purple. Like a bad Jimmy Osmond dream. I have known people whom have disputed that their is such a color as purple, meaning that either purple is a shade of blue or a shade of brown. If any of them were to witness this creature, they would understand what the color of purple is. I couldn’t describe it as a deep purple nor a dirty purple. Only a purple in it’s purist form. The creature stood about fifteen feet high when it was sitting, hunched over in front of me. I later discovered that this creature would measure an easy thirty feet from head to bottom, once it was airborne. I say bottom, because it didn’t really have a tail. The head of the animal was unusually small compared to it’s massive body, the beady purple eyes would remind anyone who has the misfortune of seeing them, believe that this creature could be of the raton family. While other characteristics of the head also had many features of the raton family, being of noteworthy comment is the long pointed ears from which protruded from the top of the creatures head. The nose was rather small. The most pronounced feature of the nose being it’s unusual color of purple. I believe this is the only creature in the world that has a purple nose. The wing span of the creature looked very small, as if it couldn’t fly with such a small wing surface. However, I later learned, once the creature was airborne, the wings extended out to form a wingspan of a good forty feet. The most disturbing feature of the large beast was it’s hands. It appeared to have four sets of them. Perhaps I should clarify that to mean two sets of claws/hands on the wings, about mid way and another set on the torso, almost as if they were human. (I didn’t notice the hands near the torso until another encounter with the large animal the next day.) The creature was very frightening to look at and could almost be a cross between a large bat and a excessively large furry human. I believe the most accurate description would be that given by some of the local towns folk, whom later had the misfortune of encountering the beast and naming it “Batsquatch”. Well, perhaps I’ve mentioned to much. My worst fears are that I will be traced by my email address and someone would know my location. Thus making me a laughing stock of my community and ending my rather prestigious position within the city. If you would like to hear more of the story, you may email me. However, should you make any attempt to trace my email address, I will deny everything. With very few reputable sightings, it is hard to pin any good theories down on what Batsquatch might be. I will say that I don’t believe that there is another race of flying monsters drifting around our skies. That would require a population big enough to breed and that seems highly unlikely considering the tiny number of sightings. There are two options as I see them for where Batsquatch might come from. The first is that Batsquatch is an extra-dimensional creature that dropped through a rift and got stuck here. If the first sighting really was in close proximity to the Mt. St. Helens eruption, it seems probably that the force of the blast may have ruptured time/space allowing something to get sucked through. In that case, it may have flown around for a while and died in some remote location, or else found a way home. I suspect this is the same as with Dover Demon. Both may just be creatures that got stuck here on accident. The other option is that Batsquatch is actually an alien. Consider that Brian Canfield’s truck died without reason and restarted after Batsquatch left just as happens with many UFO encounters, it does not seem completely improbably that a UFO dropped off a Batsquatch to do recon on the area. Less likely is that Batsquatch is a full on demon or monster of some sort. If that were the case then I would have expected Canfield’s testimony to include an unnatural level of fear or dread as is experienced by people encountering Black Eyed Kids. Post your comments below on what you think Batsquatch is and where it came from. If you have additional sources or links to information, sightings or drawings, please email me with them! I would love to add as much Batsquatch information as I can to this post! I have a comment and ask a question. I have noticed that over the past several decades, an increase in such strange occurrences and phenomena seem to be publicized. I’ve also noted that more and more people seem to be using mind altering drugs. Can this be simply coincidental or are more and more people simply losing their minds? My husband and i live in kelso washington, and batsquatch is here. Can someone please help me…who do i report this too? This is real, and we are a little frightened at what we seen and heard. 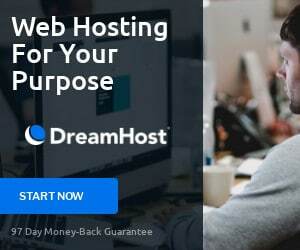 Thank you for any help i can get. I personally believe that at least some of the reports are real, as many “strange occurrences and phenomena” were around far before mind altering substances were widely used, dating back to centuries of folklore. That said, some are likely real. The reason more things are published nowadays is likely that the internet provides a place for people to recount their stories, both real and made up, possibly anonymously, and with large spread for people to see and agree with them.